Longer body pocket provides better support for baby when you’re moving and bending, making it more comfortable as you duck, weave and scramble around. 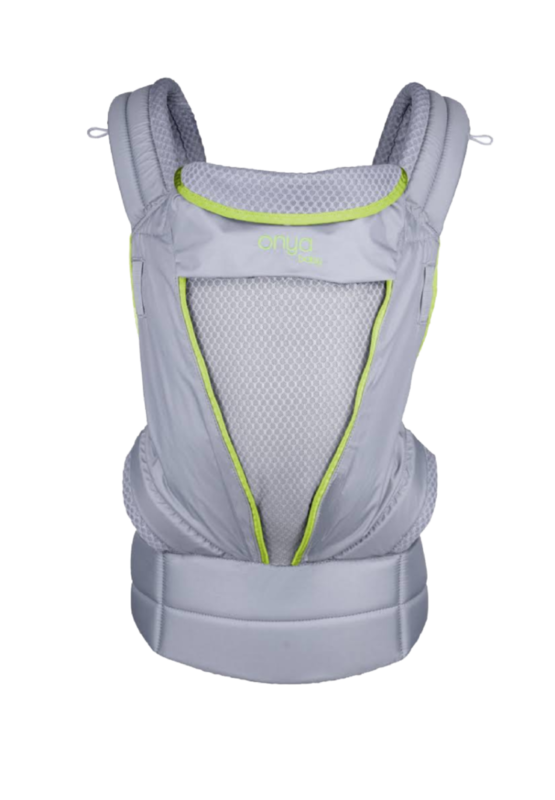 Also provides better support for baby’s head when they ride on your back. Secure waist buckle—clip locks it in place. The bottom line: I’d recommend it to a friend, and it has become my new go-to carrier choice. All the product claims are true. Its breathability makes it a stand-out. 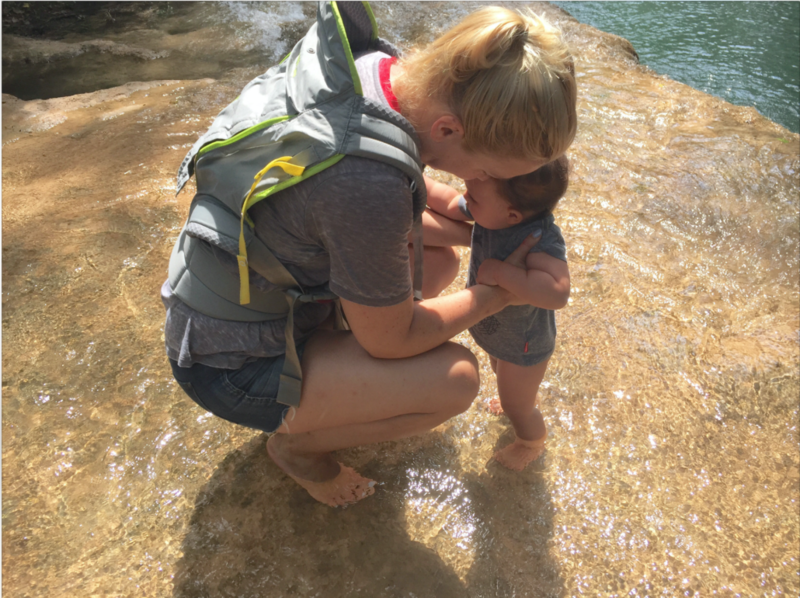 I am going to assume that if you’re reading this, you’re already sold on how great the whole advent of the baby carrier is (‘cause it is), and skip listing the amazing things inherent in using one versus not. So, living in SoCal where hikes that aren’t just blazing sun and dusty path are far and few between, I really got excited about the idea of this carrier being breathable. 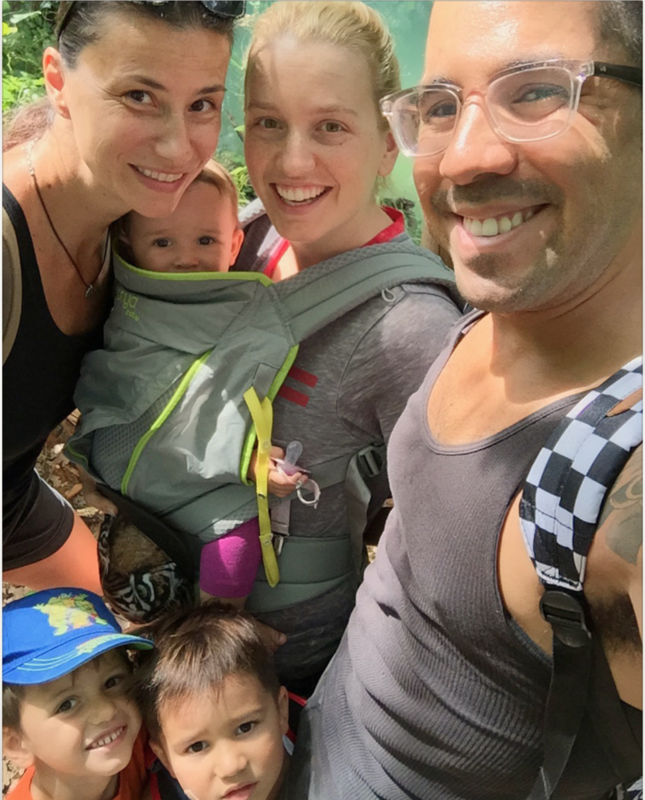 With my previous carrier, made from a heavy cotton, I had to bring a shirt to change into at the end of my hikes because both Giovanni and I would get soaked in sweat! She would need an entire new outfit herself. I even had a few hikes where I stressed about her overheating. 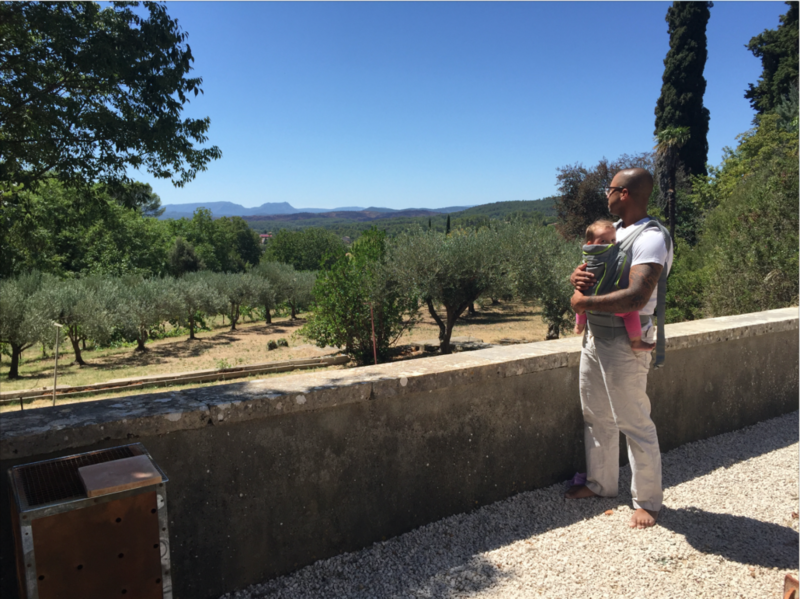 With a trip coming up to the South of France where we planned on doing a lot of exploring with the kids in hot weather, I knew it was time for a new carrier. I happened upon OnyaBaby carriers! I chose the Pure model because of the mesh panel and light weight. When breathability and simplicity is the goal—this is your carrier. I love how you can open up the middle panel for full use of the mesh, and then, if weather or environment changes (think evening cool down or a restaurant pumping the AC), simply untuck and zip the panel back in place with no fuss. Now I need to note that yes, I still get sweaty, but that’s because I’m out having fun and it’s not like this carrier has a built in fan or anything . . . but it definitely keeps Gigi and I cooler than we were before. The Pure is streamlined, which is awesome because honestly these days with two kids I seem to always have a bag with me for the essential extras of motherhood. Storage pockets in a carrier just go unused, and I’d rather trade them for breathability. The only extra I missed having on this carrier was a sleeping/sun hood, but I found a hack for that by flipping up the flap for the mesh panel to cover her head. One of the things that I had to get used to that first felt like a con but then quickly became a pro, was that the body pocket is longer than my previous carrier, the Ergobaby. I felt like Gigi’s head was too confined, that she wasn’t as able to look about as much. 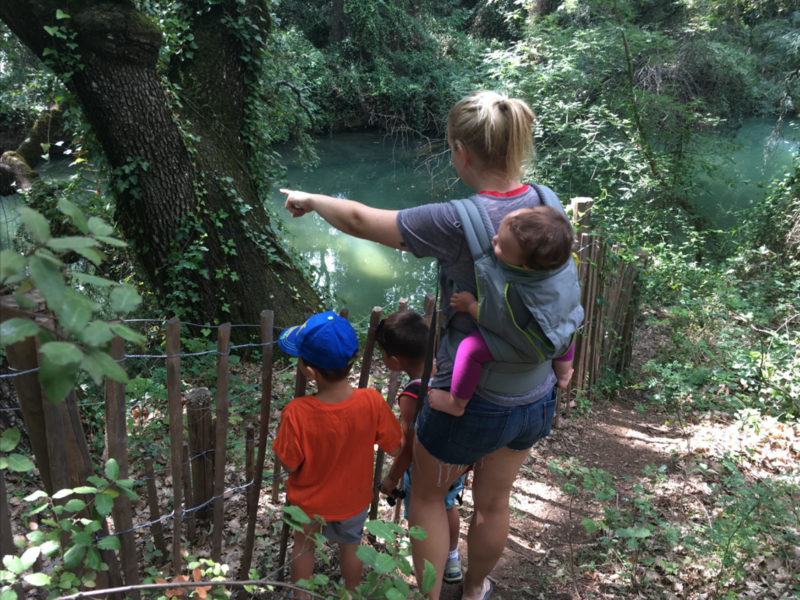 But as I ducked and weaved through the low-ceilinged caves of Cotignac, and carried her on my back along the river of Sillans while lifting my four-year-old son to see over the fences and trees, I really appreciated that pocket. It cradled her securely and I could move and lift freely! I also noticed that the longer pocket helped distribute baby’s weight, making it more comfortable to carry her longer. We stopped at an amazing little swimming hole along the river, and I ended up ditching the carrier along the banks while we splashed around. When I picked the carrier back up, I was able to just sort of brush off much of the dirt and put my damp little darling into place. By the time we got home, I may have had two filthy kids, but the carrier was totally dry and clean!